Welcome to Menzoberranzan! A poster map of the underdark capitol of the Drow. Created for the Dungeons & Dragons roleplaying game supplement written by Brian R. James and Eric Menge. It may not be a safe place to live, but I'll bet it's anything but a boring city. ... man, how on earth have I not seen this before?! Holy sh*t it's huge, fantastic! So wonderfully rich with detail! I'm glad you added color, it's very striking. Absolutely great work. Best I ever saw. 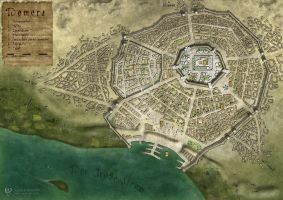 Wow Drizzt Do'Urden's city, you make me go 25 years back!!! artdevil27 - The Menzoberranzan adventure sourcebook has an insert printed at poster size. One side is in color with location tags and the reverse is sepia toned with most of the tags removed. I am speechless. Can it be found anywhere in larger scale?. There are so many details in this that are not clear in this size. Very nice, but from a cartographic standpoint the names are difficult to pick out from the art itself. So much cooler than the simple map given in the Drizzt novels (The Dark Elf Trilogy). Wonderful, so full of detail!